As we inch closer to the dark days of winter, I’m in a mood for some good, robust beers. Robust for me usually doesn’t require high alcohol content (although it can)–I think of it more as something with a strong malt backbone, prominent flavors from specialty grains, and perhaps some nice yeast character. Following on the heels of last weekend’s 80 shilling ale, tonight I brewed an Irish stout. 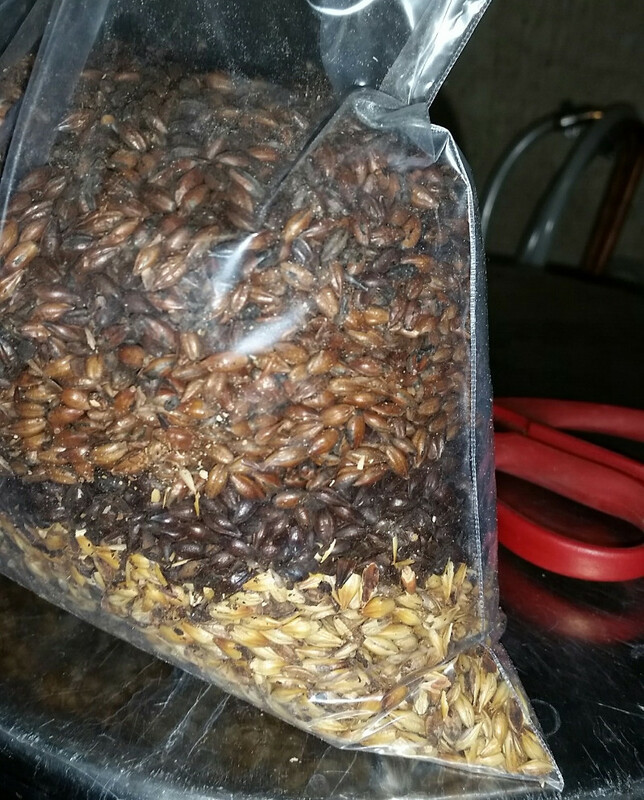 The recipe is based on Gordon Strong’s recipe from Modern Homebrew Recipes, with some modifications for the grains and hops I had on hand. My goal with this batch is to get a robust beer, but one that clocks in lower on the alcohol side of things (in this case, 4.3%). The beer is actually a bit outside the 2015 BJCP guidelines for the Irish Stout style, in terms of original gravity and color. The latter point surprised me–the BJCP lists 40 SRM as the maximum for this style, and to me it seems a little silly to set an arbitrary maximum for a beer explicitly described as “black” in the style guidelines. The name for the batch stems from the famed Irish Elk, Megaloceras. Because why not? I added the dark grains (cystal malt, roasted barley, chocolate malt, and black malt) along with 0.75 gallons of water at 160°, let the mash sit for 10 minutes, vorlaufed, and collected 3 gallons of wort. I then added 4 gallons of water at 180°, which raised the mash temperature to 164°. I let the mash sit for 10 minutes, vorlaufed, and collected the rest of the wort. All told, I collected 6.75 gallons of wort at a gravity of 1.040. This works out to ~73% efficiency, right where I had been hoping. I brought the wort to a boil, and added the hops and Whirlfloc at the appropriate times (aiming for 40 minute boil and 10 minute boil, respectively). After 60 minutes of boiling, I turned off the flame and chilled the wort down to 78° using my copper coil chiller. I transferred ~5.5 gallons of wort into the fermenter and pitched the yeast in its starter. I plan to let the temperature slowly equilibrate with the fermentation chamber overnight. The beer had a starting gravity of 1.048, exactly where expected. It was brewed on Saturday, November 21, 2015.